Until research in this century revealed its existence, Albert Kahn’s “Archives de la Planète” had not even warranted a footnote in film history, its film collections of unedited, documentary footage from ca. 1912 to 1931, never publically exhibited, never reviewed, never seen, except by an invited handful of privileged French intellectuals and celebrities. In 1909 Albert Kahn, a millionaire French banker and philanthropist from the Alsace, began an ambitious project to document the whole world in photographs (72,000 autochromes) and films (183,000 meters), hiring a whole battery of photographers and cameramen to visually document the planet, the way cartographers mapped the world. Not accidentally, the scientific director of the Kahn Archive was Jean Brunhes, one of the major French proponents of human geography, while Kahn himself was friends with the French philosopher, Henri Bergson, who like Kahn shared an interest in supporting internationalist and pacifist efforts through such organizations as the League of Nations. Paula Amad’s exhaustive study, Counter-Archive. Film, the Everyday, and Albert Kahn’s Archives de la Planète, seeks to do much more than recuperate the memory of this idiosyncratic and largely forgotten project, rather she ambitiously hopes to rewrite the history of modernism and the film avant-garde, by claiming that French film theory was beholden to a realist aesthetic of the everyday. Amad identifies six overlapping goals for her study: 1) to theorize the role of the archive, 2) to study the “everyday” in early 20th French century culture, 3) to uncover a dialogue between early non-fiction and the 1920s avant-garde, 4) to discuss Bergson’s philosophy as it relates to film, 5) to tease out the individual characteristics of film and photography, 6) to locate the origins of Andre Bazin and Siegfried Kracauer’s realist aesthetic in French film criticism of the 1920s. Stitching together close readings of not more than a handful of films (actually unedited shots) with truly admirable research into every possible intellectual, political, social, economic, and philosophical point of contact between Kahn and various other French icons of modernity, Amad has produced over four-hundred dense pages of intriguing material, which is consistently fascinating but nevertheless falls short. No matter how many intellectual traces of Kahn’s project the author finds, she ultimately is unable to tie together the loose strands to reach her sixth and final goal. The first three chapters on the mysterious and enigmatic Albert Kahn are fascinating, especially in terms of Kahn’s relationship to Bergson and his theorization of the perception of time. In chapter one, Amad notes that the Kahn archive, unlike other public moving image archives, was never intended for public exhibition, circulation or access, but only produced and maintained for the private amusement of Kahn’s guests, while Kahn himself was an intensely private, albeit extremely wealthy individual. In keeping with the burgeoning world tourism of his own class, Kahn granted travel scholarships to selected intellectuals, but also hired photographers and cameramen to film all of France and the far flung corners of the world, the goal being to document everyday life. The second chapter takes up an investigation of the everyday, discussing Bruhnes’ conceptualization of human geography with early cinema actualities, which served as a model for the Kahn archive’s methodology of unedited, static, street-level shots. The third chapter focuses on the Kahn-Bergson relationship, but also on the philosopher’s two contrasting perceptions of time as “any moment” and a “privileged moment,” and his anti-positivist belief that no archive can reproduce human memory. Since that notion directly contradicts the Kahn project, Amad introduces the concept of the counter-archive, Bergsonian images from memory which have no utilitarian or evidentiary purpose, but merely exist to be forgotten. In its focus on the incidental, the every day, the non-essential information at the fringes of the image, the Kahn project constitutes a counter-archive. Amad’s fourth chapter discusses various late 19th and early 20th century conceptions of the (film) archive, including those of Boleslav Matuszewski and Kahn, as based on positivist notions of collecting documents of the past, of reading history through the archive. But because the Kahn archive was never meant to be seen, except in some indeterminate future, the author argues that in its “documentation of excess,” its focus on the inconsequential in the everyday, it was indeed counter-archival. Even the Archive’s detailed cataloguing of shots by cameramen filling out detailed fiches, was not a guarantee of archival order. In keeping with this notion of an incoherent archive, the author’s fifth chapter notes that the Kahn Archive resists any one-dimensional positivist readings: “The archive reveals the continuing appeal of film’s potential for the infinite, discontinuous cataloguing of events, the unabashed acknowledgement of the camera, the decentered indeterminacy of meaning, the lack of focus within the frame conducive to an unharnessed gaze in the spectator, and the fascination with mundane occurrences.“ (177) Not surprisingly, the quote also captures exactly what numerous film historians have defined as the characteristics of early cinema, but goes further to state that the continuous take allowed cameramen to focus on the inconsequential and the mundane, rather than the great events of history. Here Amad correctly views the Kahn archive as particularly valuable today, because it affords a view from below, giving us images of the invisible and underrepresented, e.g. Communist Party workers demonstrating. On the other hand, one could argue that the Kahn Archive project remained aesthetically stuck in the year of its founding, 1909, that is, it remained beholden to early cinema methodologies of production, and was therefore deeply conservative rather than avant-garde. But such a thesis is not in Amad’s interest, given her attempt to wed Kahn to the avant-garde. Much more problematic therefore is her next chapter, “Seeing for the First Time,” which theorizes connections between contemporary French film theory and the Kahn project, links which can only be established through the author’s sleight of hand. True, numerous historians have commented on the avant-garde appreciation for early cinema’s informational excess, its love of scientific films, like those of Painlevé, but Amad, I feel, misreads Delluc and other theorists who noticed the camera’s ability to capture the incidental. It is another conceptual jump from such an appreciation to a full-blown realist aesthetic. As Richard Abel and others have demonstrated, it was the transformation of reality into filmic vision that fired up the Parisian avant-garde, not alone the contemplation of unprocessed reality. Chapter Seven, then, discusses the concrete reception of some Kahn films, reading reactions to Kahn’s private screenings by e.g. Bergson, Colette, and Georges Franju, later co-founder of the Cinémathèque Francaise. Unable to provide any direct evidence of avant-garde practice being influenced by the Kahn Archive, apart from the fact that Parisian city films also depicted the streets of Paris, Amad again invokes Bergsonianism, noting that the time lapse films of flowers opening (a staple of early cinema and scientific films), demonstrated moments of time between perceived time. Again her argument is pinned to the incidental. One could just as easily argue that time lapse photography documented the camera’s unique ability to create a new vision beyond reality, a vision unique to the camera, as many avant-gardists did. In her last chapter, “The Aerial View,” the author looks at travel films in the light of recent research on film’s mapping of Third World spaces in support of Europe’s (and France’s) imperialist aspirations. In contrast to the street level films, aerial photography projects a different p.o.v. of the world’s topography, at once abstract and material, alienating and strangely familiar, like the microscopic views of amoeba. In analyzing a shot of street prostitutes in Beirut who fearlessly return and mock the camera’s gaze, Amad (herself of Lebanese origin and therefore understandably drawn to this ancient image of her spiritual sisters) again focuses on all that which creeps into a film beyond the filmmaker’s intentions. Again, beyond Kracauer’s discussion of the everyday, Amad’s evidence for a realist current in the 1920s French avant-garde remains elusive. One can argue that her statement that Kracauer’s Theory of Film “is in explicit dialogue with many of the key French film critics of the 1920s,” (196) is in fact unsubstantiated hyperbole, as is her ahistorical conflation of the sociologist Kracauer of 1927 with the realist of 1960. Bazin, meanwhile, is invoked but never read, possibly because Bazin consistently identified the 1920s avant-garde with montage and anti-realism. 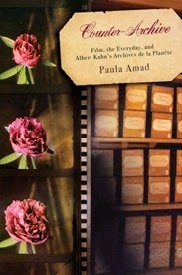 In conclusion, then, Paula Amad’s Counter-Archive must be seen as a monumental work of speculative history and theory. Like the forgotten and largely invisible shards of Bergsonian time that constitute human memory, Kahn’s archive has been resurrected and contextualized through meticulous hermeneutic research (isn’t that positivism?). Extremely well-written and consistently interesting, Amad’s book can’t however put back into history what was never there in the first place, except as a vision of what might have been. But then, had the Kahn films been seen, they may have been treated like other “primitive” newsreels by the audience at the avant-garde Studio des Ursulines, which, according to René Clair, “doubled up with laughter.” (256).